New York – With oil from a blast-damaged rig continuing to flow into the Gulf of Mexico, the price of a gallon of the Atlantic Ocean’s water rose 5.4 cents Friday, reaching a record high $2.79. It was the largest single-day increase in nearly 27 years. Investors heartened by the release of a BP-sponsored study showing the ocean is now 3/5s crude oil also brought Atlantic Ocean futures up $1.50, to close at $76.39 a barrel on the New York Stock Exchange. 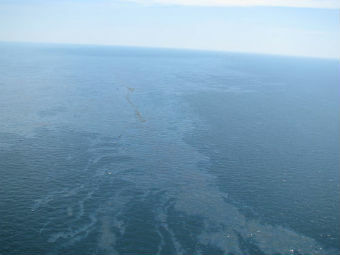 The oil spill, the largest in the nation’s history, began April 20 when an explosion aboard the oil tanker The Deep Sea Horizon caused thousands of gallons of oil to gush into the gulf. Government estimates of the amount of oil flowing into the gulf have been revised upwards to 60,000 barrels a day. The spill has greatly harmed sea life and the commercial fishing industry. The long-term health and environmental effects may not be fully understood for years to come. But on the bright side, says John Klanke of Merriweather Financial Holdings, you can now power your car with ocean water.